The Black MRDS Mini Red Dot Sight from EOTech is built to military specifications and designed for rapid target acquisition at close combat distances. Its small footprint, low power consumption, and versatility make it a force multiplier in tight quarters. 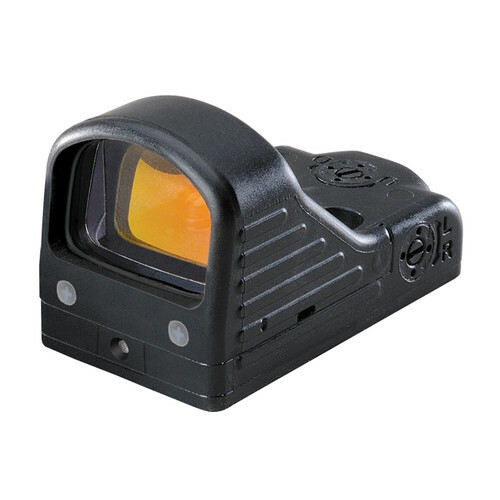 Versatility and compact size are the predominant characteristics of this red-dot. At just under 2" long, 1" wide, 1" high and just under an ounce it's about as small as a sight can possibly get. Mount it practically on any pistol, revolver, shotgun or rifle as primary sight, or as the close-quarters option of a complete targeting system in conjunction with long-distance optics. It can also be used as back-up sight atop a scope or with NVDs. The MRDS features a top-loading battery compartment that allows battery changes without the need to remove the sight or loss of zero. The 3.5 MOA dot is an optimal combination of speedy target acquisition and accuracy. You can adjust dot intensity either manually (4 brightness levels), or let the photodiode sensor automatically adjust dot brightness, providing optimal visibility in all lighting conditions. It is waterproof to 66', and was tested to environmental extremes of the 810G MIL-STD. The positive click adjusters provide 1 MOA per click windage and elevation correction are consistent and repeatable. This package includes a Picatinny mount, making it near-universal, as well as a sturdy aluminum protective shroud that will safeguard your sight against impact, mud or other detrimental incidents. We offer international shipping for the MRDS Mini Red Dot Sight. For shipments to Russia, the maximum order value (including shipping charges) is 5000 Rubles per shipment.